I talked to Zack a few weeks ago to learn more about his career and success stories, what made him switch from design to growth, what he learned building 3 growth teams and how people should think about growth. If you want more content like this, you can signup to my weekly newsletter. Below is a lightly edited transcript of the conversation. Maxime: Zack, thanks for taking the time! Could you briefly explain us how you got to where you are today? Zack: I joined my first fast growing startup in 2003, I joined them as a designer on the marketing team. The team was spending about a million, a million and half dollars a month in paid marketing so it was a very high pace, very metrics focused business. As a designer back then, I did a lot of creative work, mostly around designing ads. Coming from a design school, I was trying to bring together the best aesthetics and the most prettiest designs. What I quickly learned is that, it was not the thing that was getting people to click, but what worked was really looking into the user’s psychology. Because we had such a high budget for paid marketing, we were able to do a lot of variations and test a lot of things. We quickly saw what was driving people to the end goal, which was to sign up for our service. So that’s what really kind of made me fall in love with A/B testing and analytics. After that, I still remained a designer for many years but as an hybrid, I worked mostly in product management. And then growth is just kind of part of that, being a Product Manager, being a Head of Product, you have to make your products grow or they die, it’s really as simple as that. Design and Products have been my wheel well, and then Growth has always kind of been the outcome. Maxime: You worked in Marketing, Product & Growth - what differences & similarities do you see between those 3 jobs? Marketing is typically very focused on the top of the funnel. It’s all about getting more users to your website, that’s just marketing, and typically if you’re a marketer that’s your job. That’s your sole job, you drive users to your website or application, you go home and then you just repeat the next day. To be a true growth person, you really need that expanded skills set, that diversified set of knowledge that you can bring to the table to solve big problems. As a growth person, you are really looking full stack - which is kind of a buzzword as well - but it’s really looking at the entire picture of the business from a high level lens and looking at opportunities. Yes you need users before you focus on retention, but if your product is not ready for retention, if you don’t have product / market fit, if you don’t have a revenue model in place, you are just filling up a leaky bucket. As a product person, and product is also a little bit of an ambiguous title - it means different things to different people - but you are really owning the entire product and that’s your job. And as a growth person, you own the entire experience and that’s your job. As you can see there is going to be an overlap and I think where a lot of companies get in trouble is when there is not clearly defined swimlanes, people start to climb and their egos get in the way. Typically what I found worked best in my experiences when I worked in a growth role, is when I’ve worked really closely with the Head of Product. We balanced each other out. The Head of Product is typically focused on user experience, really looking through a lens of empathy, and as a Head of Growth, we are really looking through the lens of “where is the biggest opportunity to make the biggest impact and grow in the shortest amount of time possible”. So if I was left to my own devices, it would be too aggressive, if a Head of Product was left to their own devices, we would grow to slowly, so together there is a balance. And the end result that you get is a great product that is tuned for scalability. Maxime: You talked about Growth as having a high level lens on the business. That sounds like what is known as a Growth Model, what do you think of it? Zack: Growth model is a fancy term that Andy Johns made up to really just explain this higher level lens. Look at the entire business and understand how the business can get to scale given the type of business it is - a SaaS business, a consumer play, a marketplace - all those types of businesses have different mechanics, audiences and ways for growth. So, a growth model is really looking at what’s the strategy. I think the mistake that lots of junior growth people do is they just look at tactics: “I just need to send this email” or “I just need to focus on our conversion rate on this particular landing page”. Growth Model is taking a much higher lens, what’s the business? And what are the big levers that we need to focus on? Versus the tiny tactical thing. That’s really just a mindset, and often the difference between a manager or a leader and an individual contributor. But an individual contributor can easily reset their frame and look at the business in this new way and when they do they have more intelligent conversations with their executive team than just recommending these trivial hacks. And this is where the growth hacker thing got in trouble and that’s why no one says growth hacker anymore, it’s because of that problem. Tactics vs Strategy. Frameworks are great because they make good blog posts, but for every business, their needs to invent the growth model and the framework for that business. Maxime: You worked for both B2C and B2B companies, how different working on growth is for those 2 types of company? Zack: There are similarities and there is polar differences. B2B is typically content marketing, lead generation, drips and it’s the marriage between marketing and sales but it also depends on the size of the business. There is self-served B2B, which is getting people to the end of the funnel - that’s looks a little bit more like a consumer marketing play. But once you start to get up-market and get into SMBs and mid-market or Enterprise there is a sales process in place with prospecting, SDRs, Account Managers, etc and that whole pipeline. Between both of those [B2B & B2C] combine there’s only five scalable channels: Paid acquisition, Viral, SEO, Sales and Partnerships. So SEO / Content Marketing can work for both sides but you have to think about your strategy for who you’re trying to bring to your website or marketplace. For example for Hired we had to think about pages that are like “hey I’m looking for a job in San Francisco” vs pages that are more focused towards “we have Ruby on Rails developers in San Francisco”. You are kind of bringing the two sides to the marketplace through a different positioning with landing pages. For referral, network effect businesses and social sites, there’s an intrinsic value to inviting your friends into a network, to get more value out of the product. For sites that don’t have that going for them, you have to leverage some kind of affiliate program where there are some upsides whether it’s monetary or feature functionality or something that rewards users for inviting their friends. For Hired we gave away $1,300, it’s a pretty big reward but that worked very well for us. That’s a huge reward that not very many other companies can offer. That comes down to customer acquisition cost, even at $1,300 that was still cheaper than our paid marketing average customer acquisition cost after everything was averaged out and that was our biggest channel, we were spending hundreds of thousands dollars a week on paid. The referral program has grown to 70% of Hired’s candidate acquisition so it’s a great channel if you can get it to work. Virality of course - that’s the one everyone dreams about - but that’s the absolute hardest thing to do, especially today. Maxime: Seems like you got some wins under your belt. Can you give us some examples? Zack: I’ve had a lot of wins in marketing over the years, I’ve had very successful viral campaigns where we were signing up 600k people a day, I’ve had successful SEO campaigns where we outfought incumbents who had a 10-15 years head start on us in inbound link strategies, I’ve had successful paid campaigns - spending millions of dollars a month, etc. Those are not the most successful things I’ve done for growth. The most successful thing I’ve done for growth are mid to end funnel. And that’s product. That’s actually changing the thing that people are actually coming on the site for and that is what affects retention, that’s what get people to the aha! moment, that’s what get people to organically tell their friends and family about the thing that you are bringing to the market. I mentioned revenue before, but the pricing model is the biggest thing you can do to change the bottom line of your business. I worked with the former Head of Product at Shutterstock when I was at Hired and when they were ramping up to go IPO, they had a myriad of different pricing experiments on their subscription plans. They were trying all kinds of different things and then just locked in people who saw those offers so they won’t change on them. But that’s where you are going to make the biggest bang for your buck, it’s really figuring out this. Maxime: You built Growth Teams at Branchout, Creative Market & Hired, can you talk about how you did it? Zack: Growth Teams are interesting! At Facebook, I think half the company is their Growth Team, at Twitter I think it’s 500 people or something. For every business you look at, at the end of the day it’s just people focused on pieces of the funnel, different customers or different big problems in the company and try to solve them together. Sometimes people have more of an engineering background, sometimes they have more of a product background or a marketing background, so it really depends on the business and the problem you are trying to solve. At Branchout we were a 3 person team in a 7 person company. We were an autonomous team that was very focused on optimizing the onboarding experience, we were really looking at that viral loop and how we can tune it, and make it as efficient as possible. There was a full stack developer, there was an analyst who was also running all the experiments, and I was heading up product, designing and managing the team. That kept the team really lean. We also had the benefit of having a lot of traffic behind us so we could see statistical significance 15 minutes after running a test because we had so much traffic. We could set that winner live and run another one on top of it. And we just move that cycle so fast, we made a huge impact at the time - we also had the benefit of the facebook platform. 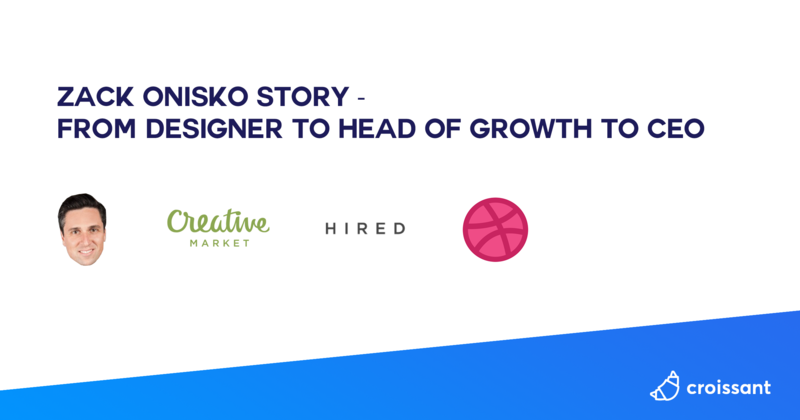 At Creative Market, it was a totally different story, I started has the sole growth person and it was a very small team and we just planted seeds and watch which one would sprout. Then I would found an expert for that particular channel and bring them onboard to own that channel. From the outside looking in it looked very much like a marketing team with a head of content, a couple of analysts, a partnership person, a paid person and so on. But the way we operated those teams was very analytical. Everyone had goals, we all met as a team on a weekly basis, talked about those goals, talked about their relative metrics, talked about if we were hitting those goals, reset goals, etc. That really pushed our efforts and really allowed us to focus and think like a growth person, which is prioritization. You have so many hours in a day, what are you going to work on to make the biggest impact for growth? At Hired it was very similar as well, we built a SEO team, we built a content marketing team, a social media team, a team that built the referral program in-house, with another team focusing on conversion optimization. Maxime: What’s specific about a Growth Team that makes it one and not just a Product Team or an Marketing Team? Zack: Let’s talk about the content marketing team for example, what we typically see is that they hire writers and they write without any kind of investigation into why are they writing, and what is the end result of that effort. As a Growth Team, we had a very clear strategy and that’s the key thing; to have a strategy in place for everything you do. Content marketing wasn’t really around this fluffy idea of “just produce content for your audience and people will come and read it”. At Creative Market, we had IStockPhoto and ThemeForest who had just tons of inbound links and they were getting all the love and all the searches. One thing going first, we knew we would want this high end terms but we were also building this market place which was targeting the long tail keywords as well. Content Marketing is really a mean to augment SEO. The growth focus for that content team was really looking at each point in that loop and looking at how we can optimize it. We spend a lot of time A/B testing the sharing UI on the blog posts, optimizing titles, looking at the posts themselves, the images that were associated with the posts and even the content itself. So as a design community, writers want to write stuffs about design and designers are posting that on facebook but only their designer friends are going to find that content interesting. But if we open up the span of topics on general creativity, you know somebody’s grandma could read this post about psychology of colors, click through and then share that with their network and then the cycle continues. So we really focus on that instead of really getting caught up on our funnel. What we were really trying to do is maximise the number of inbound links and maximise the number of people who share this content that we were creating. So we wouldn't acquire people through our content, who became users of the market, we acquire people who became viral contributors who kept those viral loops spinning. So that was kind of the focus of that content team which is kind very different from everyone else. We spent a lot of time looking at the types of content, we had the content team pull numbers on page views 2 weeks after a post and 2 months after a post; and we could see different trends, short spikes, etc. And typically we saw that there are posts that are trendy, they got a lot of shares in a short amount of time. And there are posts that are tied to high volume search terms where we saw traffic coming over and over and over again because people were searching for these terms and finally read our blog posts about those specific terms. Maxime: Do you have a recommended Growth Team structure? Zack: I think it’s all up to the head of growth to define what their growth team looks like and how it operates. I think the business, the market, the audience, the opportunity should all define how a growth team works, and how it works internally within the business. Every company is going to be different, that’s why you go company to company and every growth team looks different. There’s a lot of advices and there’s a lot of people talking about growth and about processes and standardizing this new role, this new “function”. The advice is good but I worry that by standardizing a lot of this process, that we lose a lot of the magic, which is really just trying to find the right opportunities for the business and building a strategy around those opportunities. And then building a team around those strategies versus building a team to go look for the opportunities. The optimization experiment cycle has almost become the new “viral”, everyone wants to run tests. In reality, unless you have a ton of traffic you’re not going to get a successfully high cadence experiment program. So if you have a growth team and the majority of that growth team just wants to run experiments and A/B test you need to have a very large high traffic website or application in order to do that successfully. Otherwise, you can be running tests and they are going to be set live for many weeks before you get it to significance and there’s already so many tests you can run at any given time before those tests start to collide and bias each other. So growth is much more than experimentation, at the end of the day when you start a business, the first growth people are the founders. The CEO should be finding that strategy and really define the market because they are the people responsible for bringing this business to life in that particular market. And so hopefully there is already a strategy in place and then you can start to bring smart people to look wholistically - who tends to be that kind of Head of Growth person - and if you’re building a team, you typically find people to own different pieces of the puzzle, analysts, paid marketers, whatever makes sense for your business. That strategic focus and higher lens is really key and I think you need to have a battle plan before you bring the army to the battlefield. Maxime: You started your career in design, moved to Product, then Growth and now you are CEO at Dribbble, do you have mental frameworks that you use to pick the right opportunities? Zack: If you think of the way that VCs look at investing in startups. That’s the way entrepreneurs should really look when starting startups. And that starts with asking the right questions: Is there a market large enough to build a sustainable business? Is the market already crowded or is there an opportunity for a new player, a new way to do it? Is there an opportunity to be an innovator and become a winner take all in a particular niche? Those are really important things to investigate and to be completely honest with yourself when you start a business. 2 - The other big problem is when entrepreneurs do a “me too”. When there is already a successful business in the market and they think “oh let’s do the same thing and give it a different domain name”. You can’t go and build the next facebook because facebook is already facebook. Maxime: Thanks again for taking the time. It was very insightful! Where can people find you online?